1استادیار دانشکده کشاورزی بردسیر، دانشگاه شهید باهنر. 2دانشجوی دکترای فیزیولوژی دانشگاه فردوسی مشهد. 3دانشجوی دکترای زراعت دانشگاه زابل. به‌منظور بررسی اثر تنش شوری بر برخی رفتارهای فیزیولوژیکی گیاه زعفران، سه توده بومی جمع‌آوری‌شده از شهرستان‌های گناباد، فردوس و تربت‌حیدریه تحت اثر شوری آب آبیاری با مقادیر هدایت‌ الکتریکی5/0، 3، 6، 9 و 12 دسی زیمنس بر متر طی دو سال آزمایشی در زیر یک محافظ باران و در گلدان در قالب طرح بلوک‌های کامل تصادفی با سه تکرار در مرکز تحقیقات شوری یزد انجام شد که سه سطح توده بومی و پنج سطح شوری در آن‌ها به‌صورت فاکتوریل توزیع شدند. پس از سبز شدن یکنواخت بنه‌ها، به‌تدریج و با فواصل زمانی هفتگی، آب‌شور با هدایت الکتریکی موردنظر برای آبیاری هر گلدان اضافه شد و کسر آبشویی 30 درصد برای کنترل شوری خاک اعمال گردید. نتایج نشان‌‌ داد که با افزایش میزان شوری، محتوی نسبی آب 26/6 درصد، وزن خشک اندام‌ هوایی 80/19 درصد، تعداد کل برگ 042/17 درصد، وزن خشک بنه 42/49 درصد، غلظت قندهای احیاکننده در بنه و برگ 36/43 و 72/23 درصد کاهش و میزان نشت یونی غشاء سلولی در بنه و برگ 34 و 27 درصد، غلظت یون سدیم 70 درصد، نسبت سدیم به پتاسیم 66/66 درصد و غلظت پرولین در برگ 88/2 برابر نسبت به شاهد افزایش یافت، که در اکثر موارد این نوسانات با اعمال تنش 3 دسی زیمنس بر متر آب آبیاری مشاهده می‌گردد. نتایج همچنین نشان‌ داد که توده بومی گناباد ازنظر صفات رشدی مثل تعداد کل برگ، وزن خشک اندام هوایی و تعداد کل بنه نسبت به دو توده دیگر برتری دارد اما ازنظر مقدار کلروفیل b، مجموع کلروفیل a و b، توده بومی فردوس از برتری نسبی برخوردار است. 2PhD Student of Crop Physiology, Ferdowsi University of Mashhad, Iran. 3PhD Student of Agronomy, University of Zabol, Iran. 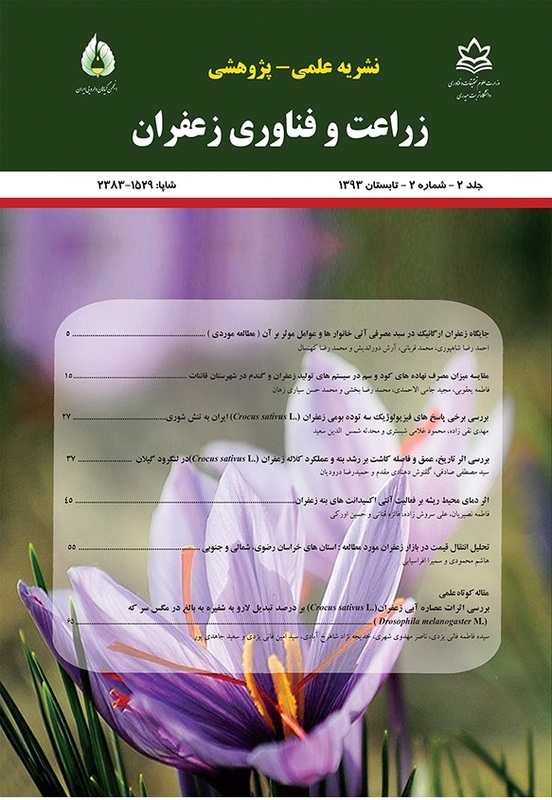 In order to study some physiological responses of saffron under saline conditions, three landraces of saffron which were collected from Gonabad, Ferdows and Torbat-e-Heydarieh were compared under 0, 3, 6, 9 and 12 dS/m electrical conductivity of saline water during two years under a rain shield in pots in a randomized complete block design with three replications at the Research Center of Yazd which three levels of the landraces and five salinity levels were distributed as factorial. After uniform emerging of the buds, NaCl solutions with the above mentioned levels of salinity were used gradually for pots irrigation with 30% leaching fraction in order to control soil water salinity in desired levels. The results showed that with increasing salinity, relative water content 6.26%, dry weight 19.80%, the total number of leaves 17.042%, the dry weight of corm 49.42%, the concentration of sugars in the leaves and corms 43.36 and 23.72% were reduced and corms and leaves ion leakage 34 and 27%, sodium concentration70%, sodium to potassium ratio 66.66% and proline in leaves 2.88 times were increased that in most cases these fluctuations were observed in 3dS/m of irrigation water. Abbasi, F. 1998. Study the physiological effects of different concentrations of NaCl on seed germination of Atriplex and determine its salinity tolerance, M.Sc. Thesis, Faculty of Sciences, Ferdowsi University of Mashhad. (In Persian). Al-Rawahy, S.A., Stroehlein, J.l., and Pessarakli, M. 1992. Dry mater yield and nitrogen-15, Na, Cl, and content of tomatoes under sodium chloride stress. Journal of Plant Nutrition 15: 341-358. Aqayof, Y. 1994. Some fundamental issues in genetics, cytogenetic and selection Saffron (Crocus sativus L.), Proceedings of the second symposium on saffron cultivation of medicinal plants, 12-13. (In Persian). Arnon, D.I. 1949. Copper enzymes in isolated chloroplasts, polyphenol oxidases in beta vulgaris. Plant Physiology 24: 1-15. Arvin, M.J., and Kazmypour, N. 2001. Effects of salinity and drought stresses on growth and chemical and biochemical composition of four varieties of onion (Allium cepa), Science and Technology of Agriculture and Natural Resources 5 (4): 52-41. (In Persian). Babaeian, N., and Ahmadi Tabar, M. 2002. Plant growth in saline soils and barren (translation), Mazandaran University Press. (In Persian). Bates, L.S., Waldren, R.P., and Teare, I.D. 1973. Rapid determination of free proline for water stress studies, Plant and Soil 39: 205-208. Chaparzadeh, N. 1996. Interaction effects of salt (sodium chloride and calcium) on photosynthesis, growth and mineral content in alfalfa (Medicago sativa L.), M.Sc. Thesis, Faculty of Science, Teacher Training University. (In Persian). Cicek, N., and Cakirlar, H. 2002. The effects of salinity on some physiological parameters in two maize cultivars. Bulgharian, Journal. Plant Physiology 28 (1-2): 66-74. Flowers, T.J., Duque, E., Hajibagheri. M.A., Mc Gonigle, T.P., and Yeo, A.R. 1985. The effect of salinity on leaf ulrrastructure and net photosynthesis of two varieties of rice: Further evidence for a cellular component of salt resistance. New Pytology 100: 37-43. Hassani, A., and Omid beigi, R. 2001. Effects of water stress on some morphological, physiological and metabolic basil, Journal of Agricultural Knowledge 12 (3): 59-47. (In Persian). Heuer, B. 1994. Osmoregulatory role of proline in water and salt stressed plants. In: Hand book of plant and Crop stress (Ed. M. Pessarakli), 363-381. Marcel Dekker Inc. New York. Hong, L. 1996. Effects of salt stress on root plasma membrane characteristics of salt-tolerance and salt sensitive buffalo grass clones. Environmental and Experimental of botany 36: 239-245. Jiping, L., and Zhu, J. 1997. An Arabidopsis mutant that requires increased calcium for potassium nutrition and salt tolerance- proc.NaCl. Academy of Science of USA. 94: 14960-14964. Kafi, M., Rashid Mohassel, M.H., Koocheki, A., and Molabfi, A. 2002. Saffron, technology, production and processing, printing, language and literature, Ferdowsi University of Mashhad. (In Persian). Kaya, C., Higgs, D., and Kirnak, H. 2001. The effects of high salinity (NaCl) and supplementary phosphorus and potassium on physiology and nutrition development of spinach. Bulg. Plant Physiol 27: 47-59. Kazemi pour, N. 1999. Salinity and drought stress effects on chemical and biochemical characteristics of short day onion varieties, M.Sc. Thesis, Faculty of Science, Shahid Bahonar University. (In Persian). Khodadadi, M., and Omid Beigi, R. 2004. Effect of sodium chloride salinity on some physiological characteristics of two onion cultivars, Journal of Agricultural Science 14 (3): 25-11. Maas, E.V., and Hoffman, G.J. 1977. Crop salt tolerance – current assessment. Journal of Irrigation and Drainage Division. ASCE: 103: 115-134. Mighani, F. 2002. Study the physiology of salt tolerance wheat, PhD Thesis, Tehran University. (In Persian). Mirmohammadi Maibody, A.M., and Qara Yazy, B. 2002. Salt stress and physiological aspects of plant breeding. Publishing Centre, University of Technology. Mozaffari, H. 2004. Role of calcium in plant resistance Flix weed (Descurainia sophia) to salinity, M.Sc. Thesis, University of Kerman. (In Persian). Postini, K. 1994. Photosynthetic responses of two wheat cultivars to salinity, Journal of Agricultural Science 25 (1): 61-69. (In Persian). Saadati, A., Ghare Yazi, B., and Mirmohammadi Meybodi, A.M. 2004. Salt stress and physiological aspects of plant breeding. University of Esfahan. (In Persian). Sabzevari. A. 1995. Saffron red gold desert, Agricultural bank, No. 46. (In Persian). Sadeghi, B. 1989. Effect of weight of onion on saffron flowering, saffron project, Iranian Research Organization for Science and Technology, Department of Khorasan. (In Persian). Shahande, H., and Mousavi, M. 1988. Evaluation of physical and chemical properties of soils in relation to water and saffron in GONABAD, Research Projects, Scientific Research and Industrial Organizations of Khorasan, Iran. (In Persian). Shahbaz, M. 1992. Effects of NaCl salinity on the morphological structure - anatomical and some physiological features of stems and leaves of plants Sunflower, Master Thesis, Faculty of Science, Teacher Training University. (In Persian). Shi, D.Sh.Y. 2008. Effects of various salt-alkaline mixed stress conditions on sunflower seedling and analysis of their stress factors. Environmental and research Botany 54: 8-21. Somogyi, M. 1952. Note on sugar determination. The Journal of Biological Chemistry 195:19-25. Tahmasbi, L. 2003. Effects of salinity and some growth inhibitors on morphological characteristics, biochemical and chemical Pistachio almond cultivars, master's thesis, Shahid Bahonar University of Kerman. (In Persian). Yazdani, M. 2003. Effect of N form on some physiological characteristics of salt-tolerant sugar beet, master's thesis, Tarbiat Modarres University. (In Persian). Yousefi, A.M., and Shahbazi, Sh. 1993. Resistance of different wheat cultivars to salt stress by measuring free proline. Research Project, Seed and Plant Improvement Institute. (In Persian).